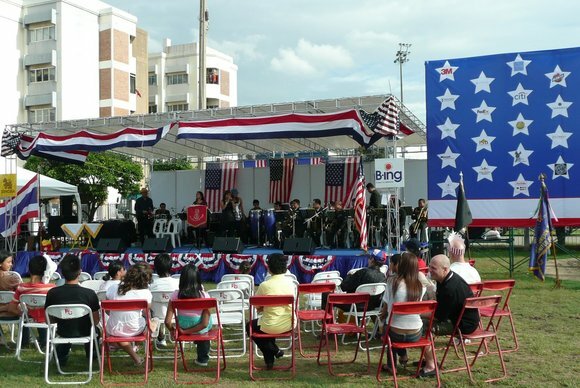 Saturday July 5th was the American Chamber of Commerce’s annual Independence Day celebration in Khrungthep. What used to be hosted by the U.S. Ambassador on the stately grounds of his residence on Wireless Road was discontinued several years ago because of security concerns. A few years later, AmCham resurrected the tradition, moving to a new location at a football field and sports complex in Khlong Toei. Invitations for the event came from two directions: Doug, a friend from Oregon, is involved in AmCham and sent an email. 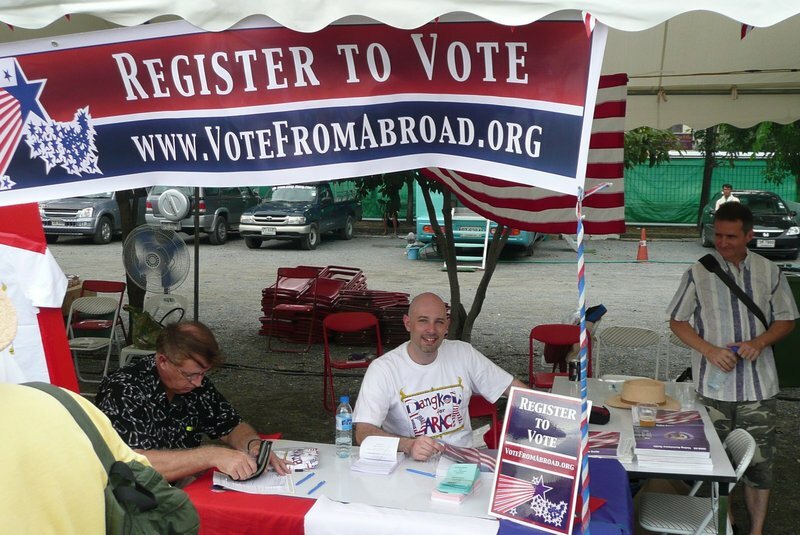 A second email came from Democrats Abroad Thailand, which conducts a voter registration drive at the event. There was a nice breeze Saturday afternoon and the gathering thunderstorm clouds provided some intermittent shade and, thankfully, nothing more than a few seconds of sprinkles. We were able to find a shady place to sit while the grounds were emptied and swept by heavy security. The process for entering the field was slow – there was only one gate with two metal detectors and everything was being hand searched, much more thoroughly than even at the airport. But we were in the shade and there were plenty of distractions while we waited to enter. The set-up was very much like any Independence Day celebration in small town America: vendors offering barbeque, hot dogs and beer; raffles and giveaways; informational booths for different civic groups; giant slides and other games for the children; a stage with life music, magic shows, and other entertainments; the presenting of the colors by the local chapter of the Veterans of Foreign Wars; and evening fireworks. Because it is rainy season, some areas of the field were quite muddy, resulting in more than a few children who looked like they had engaged in pig wrestling contests. Along with many Americans were lots of Thais and other foreign nationals. I headed over to the Democrats Abroad table and started my two-hour shift as a volunteer registering people as absentee voters, answering dozens of questions, and selling “Bangkok for Barack” t-shirts. In those two hours, we probably signed up sixty voters and there were several hours remaining when I left at about 4:30. What was most interesting about the experience was the difference in perception between myself and the other four American expats who arrived with me. Maybe this is because I was actively working at the booth while they grabbed some food and drinks and sat under a tent visiting and, it sounds like, complaining about the event. The field was too muddy. There were too many Americans there (or maybe too many fat Americans?). Too many of the songs played by the band were not from American artists. For the 300 baht entrance fee (about US$10; the event was a fund-raiser for charity), there should have been food and drink included. Instead of hanging around with other Americans trying to do American things, people who attended the event should be participating in Thai culture and doing Thai things. In conclusion, the event was designed “for people who actually miss America”. While I discard as completely backwards the view of “love it or leave it” – freedom of speech is a constitutional right in the USA, after all – I can understand where that reactionary impulse comes from. Since Saturday, I’ve spent some time thinking about their concerns, trying to understand their point of view. It leaves me feeling kind of odd. There are many things I dislike about American culture and I try to hang out with a group that is more diverse than just Americans alone precisely because of the “American group think” that is easy to run into amongst any insular group of expats. There are a lot of overseas Americans who, despite being expats, care very deeply about their country and want to make it a better place. I spoke with Democrats, Independents and Republicans who were intelligent, passionate, and caring. They have strong views about what their country needs but they are also very interested in talking to and hearing from people with different opinions. In this gathering, I saw a community coming together that, despite their living in a different country and culture, makes an effort to celebrate their heritage and identity – especially for the many families that were there with their children including families of mixed cultures where the children possibly have never lived in the United States. I also saw many non-Americans coming to the event to celebrate an ideal (imperfect though it may sometimes be) that they see in America: a functioning, free and fair democracy in which people can climb to great heights and make their own success regardless of social status or background. Something that is decidedly not true in many countries around the world, including Thailand. The reaction of the others to the event left me frustrated. Frustrated in part at a sort of negativity that, political beliefs aside, looks like a dark vortex around which I wish to steer clear. Sitting around bitching and moaning just breeds more bitching and moaning. If you don’t like it, do something to make it better. Frustrated also by the increasing habit of Americans both at home and abroad to isolate themselves in like-minded circles, interacting with and gathering news from people and sources that only serve to reinforce their already-held views. It is healthy to challenge our views and beliefs, right? Finally, frustrated that my friends didn’t have more fun. The weather was nice, the Belgian beer being poured on tap from the Roadhouse BBQ stand was tasty, and the square dancing group from a local elementary school was cute. In my opinion, it certainly beats another afternoon at the mall or another night sitting on Silom Soi 4 drinking whisky and ogling Thai moneyboys. This entry was posted in Uncategorized and tagged america, Bangkok, culture, Expats, Khrungthep, Thailand by christao408. Bookmark the permalink. You are allowed to vote from abroad?? ?That sounds like a lot of room for cheating…are they even counting those? ya, that’s one of my pet peeves, people who don’t listen to other view points & only get “news” that reinforces their beliefs. like a conservative who’d only watch Fox News or a liberal who’d only listen to NPR. Hey, thanks for posting this; boy, do I hear you. I’ve never lived as an expat; I’ve only been abroad for short business trips or vacations. But I’m always struck by the degree to which Americans abroad have so many motives and expectations “at cross purposes”. To be truly honest, we depend alot on the status of the US to make travel safer, especially to the more “out of the way” parts of the world; we want the world to be alternately developed / exotic / cheap / luxurious / efficient / dangerous / safe / colorful / multilingual (!) …. depending on our mood. We often don’t want to take obvious pride in the US when we’re abroad (is that a Canada patch on your backpack? ), but we expect everybody else to watch our backs, …. because we’re from the US. When I go abroad, I like to hang with the locals, but I don’t deny where I’m from. Not sure if this addresses your post, but I needed the rant. Thx. It sounds like it was a fun event… but, like you said, for people who miss America. Perhaps your four expat friends don’t miss it enough to put the Thai culture aside for a day and celebrate American culture and independance. I would imagine that when someone lives in a foreign country where the culture is so completely different from where they were raised, their mind wants to designate one as being better than the other, instead of just different. Even though I’ve never lived in another country, while vacationing in the few I’ve visited, I did find myself believing that some cultural traits were better than home, or the other way around. When in actuality, they were just different. Perhaps your friends felt that attending the event was expected of them as American expats and that they really didn’t have any interest in celebrating their American roots? That’s a tough one and I could see how you’d be frustrated, as I’m sure there were other American expats who had a wonderful time… and didn’t volunteer to work a booth. Did you get to watch any fireworks? you enjoyed it right? I think that matters the most! @gyjcwang – Whether they count those is a good question, but voting from abroad is the same as any other type of absentee voting. We use the same forms, etc. so the oppotunity for cheating shouldn’t be any greater than when you absentee vote from home. @generasianx – Good point, although after watching/listening to both, NPR makes slightly more effort to be balanced than Fox. Maybe CNN/FOX is a better comparison. @youniversl – I’m not sure if it addresses my post, either, but you’re always welcome to vent your opinion here. @alextebow – I left before the fireworks, but could hear them from home. There are fireworks here for a lot of events, so plenty of opportunities to see them. @Dezinerdreams – You’re right: whether I enjoyed it is really the important question. At the same time, I really want to understand whether my values differ so greatly from the values of people I’ve adopted as friends here. I couldn’t agree more. Nice job. That’s cute. It reminds me of going to the Thai Fair at the Buddist Temple in New York. What a good discussion. I think I would have felt as you do. As much as I loved the place where I lived abroad in ’68-’69 (Paris), I dearly missed the US. On one hand I was embarrassed when “we” elected Nixon, but that was also the year “The Graduate” came out and I remember the moment my roommate & I came out of that movie theater and said to each other, well, yes, Americans are really materialistic, but so are the French, and if I’m going to live in a materialistic society I’m glad it’s the US. It was familiar. It was the ground on which we were raised. I think we Americans are so very lucky that we can come and go fairly easily, visit & live in other countries and return to our own country, unlike many people who have come to the US out of duress and cannot go back to their countries for economic or political reasons. We are very lucky indeed, and yes, it’s worth paying attention to the ideals even though we don’t always live up to them. @sgtowns – Stuart, thanks for offering your take on this. I hope you didn’t literally feel the need to defend yourself. With further explanation I can understand the concern about lack of clarity on what the cover charge was for as well as the general orientation of the event towards those with children. Both are really legitimate concerns and would result in a different take on the event. The cotton candy thing, I hope everyone understand, was clearly tongue in cheeck – both in your original complaint as well as my inclusion of it. That’s why it was last in the list. And, actually, it is a reasonable complaint considering I saw cotton candy at Jatujak Market this weekend, so we know it is available here. We should coordinate additional postings with your points of view, or coordinate entries between our two blogs to provide different perspectives on events here. It lends a lot to the discussion to have this sort of dialogue. @allthingsbarbara – Very nicely said. Thanks for the additional comments. One of the most important things to remember is that as Americans, we have the luxury of living abroad out of choice, the ease of entering many countries around the world without a visa in advance, and the peace of mind of knowing that we could return home at any time with no political repercussions. Never one to comment here prior, but today it seems required. On the whole you had a good time and your friends didn’t. OK that’s fair mate, but what’s the need for the negative slap at the end of your post? These are your friends? very very very nice post; very well expressed. I am happy you are so involved in two different worlds of culture. I truly enjoyed reading it. I’m not surprised your friends were a little disappointed. Sounds pretty tame for young expats without kids. We’re used to more stimulation these days. You made the right call, Chris. I always get more out of an event when I volunteer. @highanddry – Thanks for your comment. I don’t regard the end of my post as a slap, considering that while my friends do go to the mall and sometimes go out to Silom, I wouldn’t characterise any of them as people who sit around drinking whisky and ogling moneyboys. The two activites I named are merely a reflection of activities that some expats and visitors do with their time – activities that I don’t find interesting – and nothing more. @sgtowns – I thought about buying you some, but realized I’d just finish it off before getting it to you. @ZSA_MD – Thanks; it is interesting how this has provoked a range of reactions. @Steve – I can understand why a family-oriented event wouldn’t be exciting for everyone, especially those without children. @christao408 – Exactly. You put it even better. 🙂 Thanks for replying. I enjoy your blogs. I think they’ve forgotten that most festivals here require an admittance price, then you pay seperatly for what you want inside the event. It sounds like anyone there that was not happy probably didn’t want to be there to begin with. They maybe went out of an obligation? Just a thought. It sounds like you had a good time though, You seem like a “glass is half full” kind of guy. @socaltransplant – That’s a very good point and one that I may pass on if the topic ever comes up again. Paying for admission then paying for things you want inside really isn’t a unique concept. Not even in Thailand. Hmm, I guess I gotta speak my mind about this, too! Since I (along with Stuart) was one of the four expats who was mentioned as complaining about the event, I think I need to clarify my thoughts. A little late, I suppose, as the event was almost a month ago, but better late than never. My first impression of the event was terrible, because of the embassy-like security at the entrance, complete with a metal-detector gate. People waited, literally, for an hour or more to get in, sweltering in the sun. And the guards confiscated my Swiss Army knife (which, of course, they returned when I exited). But my expectation of a lighthearted, relaxed event was quickly shattered. And the glaring security presence just happened to remind me why it’s considered necessary: because the foreign policy of the United States stirs deep resentment around the world, especially now, with a 5-year long, unjustified war going on, and that Americans have unfortunately become targets, especially in large groups. Not to mention the persistent cowboy, my-way-or-the-highway mentality that assumes that America is always right–and the rest of the world better just get used to it. When I moved to Thailand, something occurred which I never really expected–I felt a sense of relief. Relief to be free from American society, believe it or not. America touts itself as the best of the best, representing the ideal which everyone else in the world should strive to reach. But in my opinion, there seems to be very little humanity there. The land of the free. Free to get shot by one of the (literally) hundreds of millions of guns in the hands of ordinary people. Free to get sued by anyone, for anything. People are afraid of each other, and afraid even to speak up in public if someone is misbehaving, for fear of being assaulted or sued. And there is a lot of anger, much of it just below the surface. In American society, there seems to be no sense of trust in one’s fellow man. The majority of men in Thai society carry a shoulder bag of some sort, typically worn with the strap crossing the chest. Whether for a laptop computer, business papers, personal stuff, whatever. I myself bought one shortly after coming here, and it’s great. Especially since I walk quite a bit (in the States, I had a car), it makes a lot of sense to have something in which to carry an umbrella (it rains a lot here), sunglasses, cell phone, maybe a water bottle, etc. And no one in Thailand assumes that the bag implies any sort of sexual orientation–it’s just a practical way to carry stuff. Sounds like a mentally healthy attitude to me! But in the U.S., any man carrying a shoulder bag is suspected (or assumed) to be gay, and that the bag is a proclamation of such. Why, it’s a purse! So, many straight men in the U.S. are downright afraid to be seen carrying anything even resembling a shoulder bag, for fear of being labelled as gay. Another example of one of the stupid fears plaguing American society. 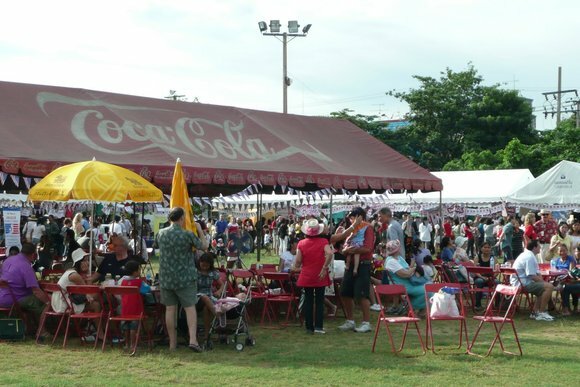 So…..when I’m walking along at this American Independence Day celebration in Bangkok with my shoulder bag, I start to realize that I’m getting looks (and some sneers) from some of the men there. It took me a minute to realize why, and it reminded me again of why I feel relief to be away from that society. Yeah, the mud bothered me a bit, and I did feel that the event flyers were somewhat misleading in that they implied the hot dogs and hamburgers would be included in the 300 baht entrance fee. I didn’t care about the lack of cotton candy (! ), but the music was way too loud, as we had to shout to each other to make ourselves heard during lunch, a pet peeve of mine. And I actually enjoyed the kid games, despite being childless myself. I think kids always bring joy to an event, as they’re typically enthusiastic and joyful. I even spent a few extra Baht to participate in throwing a ball to get the guy to fall into the dunk tank, which I thought was fun. The fact that the event was “family-oriented” didn’t bother me at all. But all of these perceptions (some good, some bad) are trivial to my chief issue with the event: that it was attempting to recreate Americana, with the unspoken assumption that everything American is good. That patriotism means supporting the war, any war. That war makes Americans feel powerful. That doubting or questioning our President is unpatriotic, possibly even treasonous. To me, the entire event represented an effort to create an environment in which people who subscribe to this misguided “Americana” mentality could rest at ease, feel at home, and cling to their belief system, in the midst of a city and a culture which they perceive to be foreign and threatening. I must say that I went to the event with cautiously optimistic expectations, so I believe that none of my perceptions were preconceived. But upon immersing myself in this event, all the negative perceptions about American society came flooding back. I certainly don’t deny being American, and I’m proud of the many, many positive accomplishments that America has produced throughout its history. But at this point, I think America needs to make some very serious changes if it wants to try again to be a credible world leader, and to begin again to credibly represent a high ideal for which to strive. And maybe more importantly, to be a better society in which to live. Let me also add that, although I’m enjoying myself tremendously here in Thailand, the country has plenty of its own issues and problems, and it’s certainly not perfect. My comments have much more to do with the state of affairs in the U.S. than as a comparison with Thailand. And maybe my comments will be taken as too heavy and serious, inconsistent with the spirit of this blog, but I felt that this point of view hadn’t yet been expressed, and deserved such. @Vic – Thanks for your thoughtful response. It is really interesting to see the event through so many different points of view. In reading your comments, it seems like your strong feelings about American culture have been overlaid on the AmCham event. Did you really see people sneer at you because you had a shoulder bag? Was there anything at the event that explicity or implicity said that everything in America is perfect or that questioning the President is treasonous? I’m very surprised about these perceptions. Everyone I saw and interacted with seemed good natured and friendly, even if they were people with whom I might not have a lot in common. I didn’t see any inherent political messages in the event, nothing that proclaimed the superiority of America. 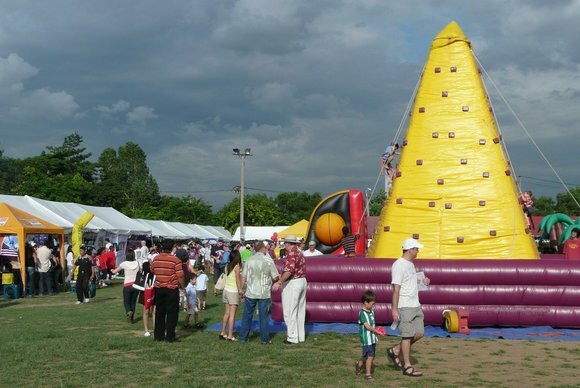 It was more like a county fair than a Klan rally. You’re right that every point of view deserves to be expressed and I welcome that on my blog, truly. I’m just trying to figure out if we were at the same event.